Are you able, and would you, put the latest posts usually residing at the bottom of the page at the top of the page. why not just use the forum correctly? I didn't know about those arrows. I always just use the "new posts page"
(or click on the yellow new posts star top right of the main page). Clicking on links in the new posts page takes you straight to the first unread. Weeell, we're supposed to have been running new software months ago. But all that fell through with the incomplete translation, and our main fearless admin leader seems to have gotten busy with his day job. Hi, thanks for all the suggestions. What I thought would be nice is if the posts you see at the bottom of the page, the one's just waiting to be perused from various sections, and waiting to be read, if they were at the top of the page. The way I get to the end of the page is the "End" key. This works for me, but might depend on different keyboards, browsers and operating systems (Kensington, Firefox and Ubuntu in my case). I appreciate it. Works for me too. Last edited by Adverse Effects on Mon, 13 Jul 2015, 16:35, edited 1 time in total. But I'm pretty slack. I drive my ev's and ride my ev's and only peruse the last 7 or whatever at least once and maybe a few times a day. That's how I do it. That's why it occurred to me to try to get what I read at the top of the page. I go into new posts and read the ones that interest me. 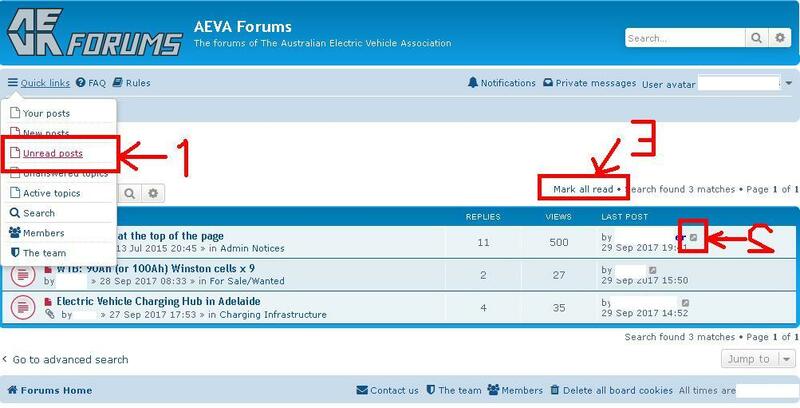 In the old forum format I could then select "Mark all as read". Is this available? 3:- to marl all posts at "read"
PS :- yes i know my 2 is backwards now that i look at it again"
I was using a sub-optimal URL to get to my unread posts. And I found your instructions exceptionally clear (notwithstanding the "interesting" numerical presentations:-). (notwithstanding the "interesting" numerical presentations:-). Also your "3" was "E" backwards which, I think, would appear ok as a "3". By total coincidence, my yahoo username is j3ffj which I created yonks ago "just to be different".